The benchmark of action-adventure games on next-gen consoles for your smartphone! Jerusalem, 1191 AD. The Third Crusade between the Crusaders and Saracens is tearing the Holy Land apart. You are Altaïr, a Master Assassin sent by the Order of the Assassins on a quest to steal the Chalice from the Templars in order to end the Crusades. The fate of the Holy Land depends on you... Plunge into this direct prequel to the critically acclaimed Assassin's Creed™, offering rich gameplay and a well balanced mix of stealth, chaotic action, and puzzle-solving exploration in the midst of the fully 3D-rendered, historical Middle Eastern environments of the Crusades. - Incredible variety of acrobatic moves for a very rewarding gaming experience. 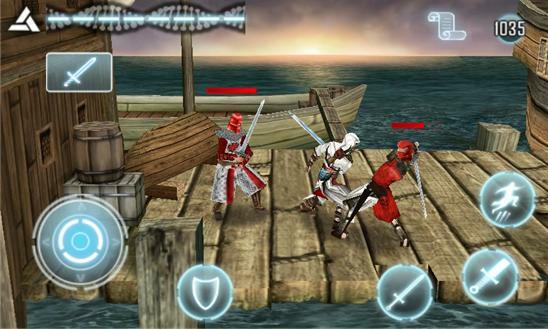 - 6 weapons for both close combat and long-range attacks: swords, daggers, grappling hooks, and bombs. - Skill-based mini-games put your patience & dexterity to the test: perform pickpocket maneuvers and make informants talk. - Unique dramatic tension, intensified by 3D cinematic cut scenes and character voices. - Collect orbs to upgrade health and weapons. 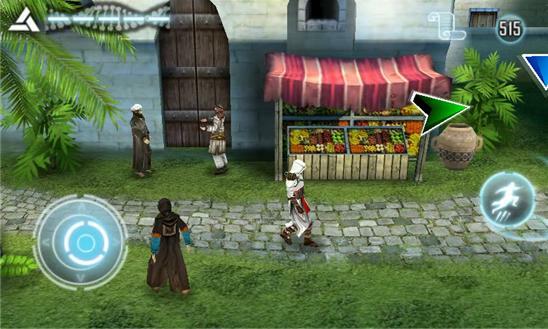 - Highly polished 3D graphics providing full immersion into a true-to-life Medieval Middle East environment.